Installing a bronze sculpture from The Large Art Company is a fairly simple and straightforward task. In fact, one of the most compelling reasons to buy from us (besides great prices, quality sculptures, excellent customer service and guarantee) is that we offer a method for securing your investment and are here to guide you through the process. To begin, it is important to point out that not all statues require permanent installation. 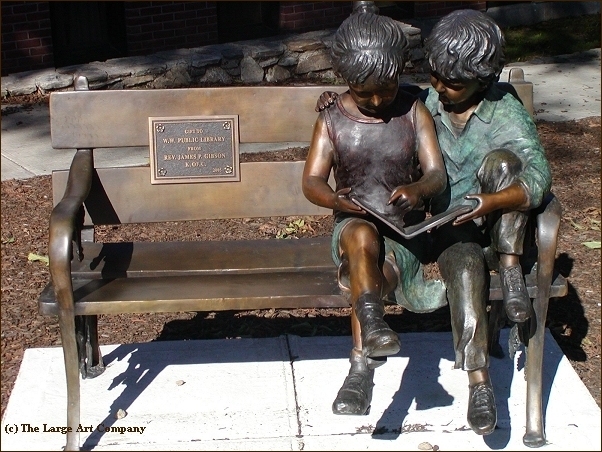 Bronze sculptures are not high theft items. They are usually very big and heavy, so stealing one would require several people and a truck. Furthermore, most people steal things because they can sell them quickly and get cash. Well, bronze statues are not the kind of thing you're likely to be able to liquidate quickly compared to a TV or stereo. 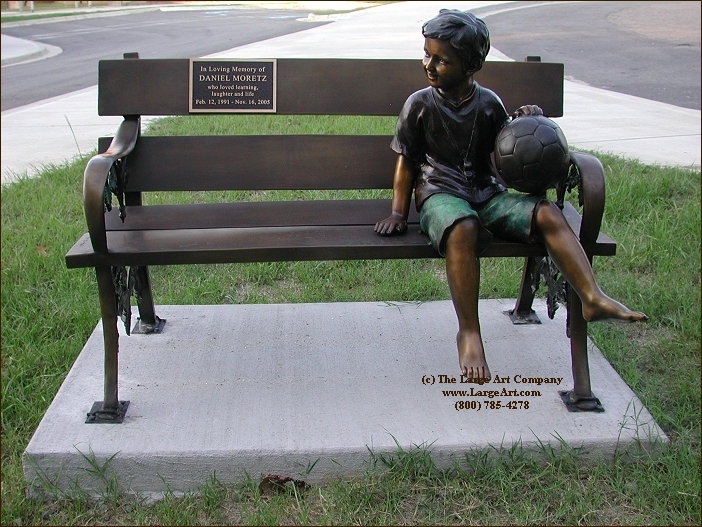 However, there are very good reasons to permanently install a sculpture particularly if you have safety concerns or if vandalism could be a problem in your area. Also, some sculptures are more top heavy and could fall over in severe storms, etc. 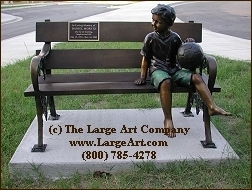 When you place your order we can talk about these issues as it relates to your particular sculpture. 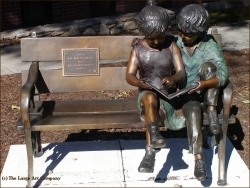 For a modest welding fee of $50 we can install mounting nuts under the sculpture. 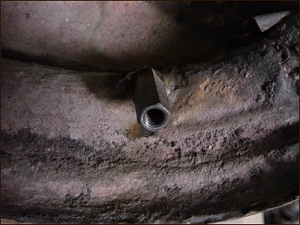 If you think of a nut and a bolt, mounting nuts look much like a nut except that are usually longer (see picture right). A convenient piece of hardware that is frequently used for sculpture installation is called "All-Thread." This is basically a threaded rod with no head at either end. These allow you to cut off (hacksaw) exactly what you need. They come in various lengths and sizes (you want 3/8"). The length you need will depend on your particular situation. Other type of hardware include lag bolts and "J" bolts that are also available in 3/8" size. The first thing you will need to do is pick a location. 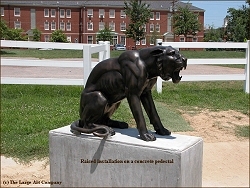 I highly recommend waiting until the sculpture is on-site before finalizing this decision or initiating installation. 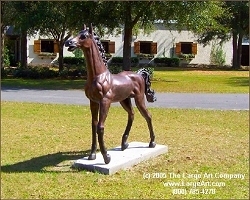 Once the sculpture is in its surroundings you may want it facing a certain way or even change your mind completely about where it would look best. 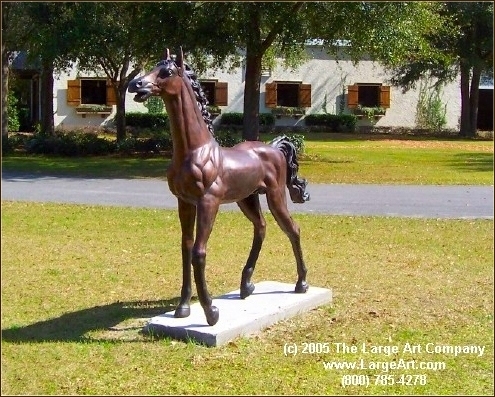 Once you have selected the best location for your new sculpture you will need a foundation. Most installations are done using concrete, but these same procedures apply for granite or other stone foundation as well. 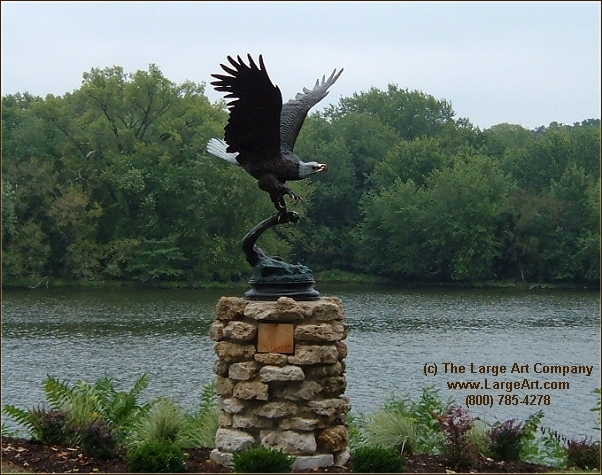 The size of the foundation you build for your sculpture will depend on the size of the piece, how you wish it to be displayed and weather conditions in your area. The most common installation is ground level. However, depending on the situation you may also want to consider a raised installation to give your sculpture more prominence in its surroundings. 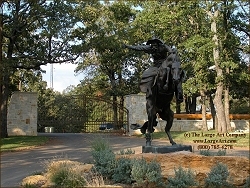 The surface area should allow for at least 2-3" border around the base of the sculpture. You don't want to insert mounting bolts at the very edge of the foundation. 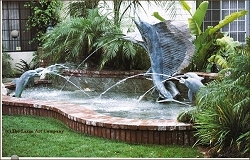 The depth of the foundation will depend on the size and weight of your sculpture and the weather conditions in your area. 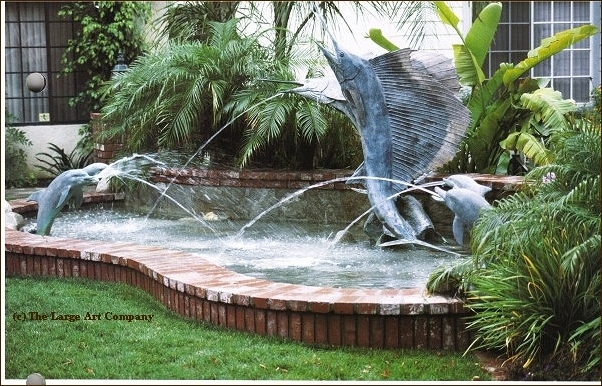 If you are working with a very large sculpture, or you plan a raised installation, it is advised that you hire a concrete professional as it may be advisable to reinforce the foundation with steel rods (also known as rebar). The minimum thickness for a concrete foundation is 4", however, 8-12" is common and some areas of the country might require even thicker foundations. If in doubt, seek professional advice from a contractor in your area. You don't want to have to do this more than once. 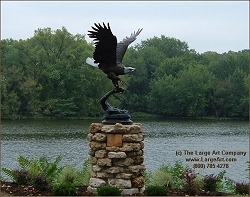 Many sculpture installations are meant to complement a landscape. A concrete foundation can often detract from the overall look you are trying to achieve. If you are looking for a very natural installation, here is a tip. When building the foundation, have the surface be 2-3" below the surface of the ground surrounding the foundation. This will allow you to fill in the area with mulch or top soil for a very natural look (see picture left). You can even plant ground cover in thin topsoil for a dramatic effect. Once the foundation is ready (new or pre-existing), you will need to drill holes into the concrete. We are frequently asked if there is a template for drilling the holes. Unfortunately, since all of our sculptures are made by hand, the precise location of the mounting nuts will be slightly different with each sculpture. 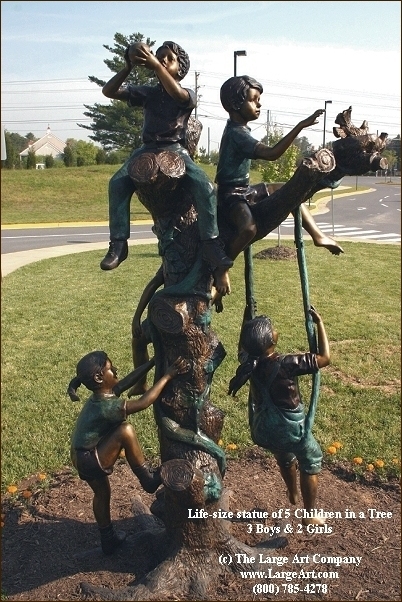 As a result, it is absolutely imperative that you wait until the sculpture is on-site before drilling. Drill holes at least 5/8" in diameter into the marked locations on the foundation. You can use a regular drill with a concrete bit, but a hammer drill is an excellent tool for this job and you can rent these at a tool rental store. Keep in mind that the precise size of the holes will depend on what type of mounting bolts you are using. Obviously a bolt with a head on the end will require a bigger hole. Also, although the hole only needs to be slightly larger that the mounting bolts, the tighter it is the more accurate your drilling needs to be. You may want to bring the statue back over and make sure the holes are drilled properly by doing a dry run before moving to the next step. Once you have drilled the holes, fill the holes approximately 75% with an anchoring adhesive. Epoxy is recommended as it is actually stronger than concrete and grips better. There is an excellent product I have found at Home Depot called Anchor Fix by Sika. Anchor Fix on AceHardwareOutlet.com It is a two-part (part A & part B) in one chalk tube with separate chambers inside that mix on the way out. The amount of epoxy or concrete necessary will depend on the diameter and depth of the holes. But keep in mind that the mounting bolts are going to force the epoxy out of the holes so do not overfill. 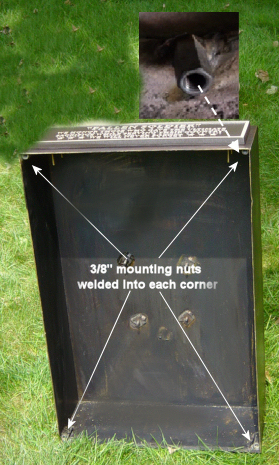 Then position the sculpture over the holes and slowly lower the mounting bolts into the holes. Some of the anchoring adhesive will likely come out of the hole, just wipe it away with a disposable rag. Acetone is an excellent solvent for epoxy. That's it! Your sculpture is now installed! We realize this installation may be daunting for some. If you have any questions at all please feel free to call us. We are happy to answer any questions you may have about installation (another reason to buy from us) and even speak with your installers while they are on site even on weekends and holidays because we know that's often when these get done.